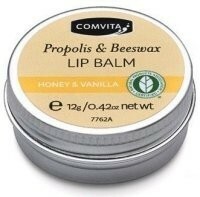 Propolis and Beeswax lip balm is a richly moisturising treat for luscious lips. The two main ingredients have emollient properties which help to restore and improve skin softness. The Beeswax acts as a humectant, drawing moisture to the skin and sealing it in. This provides a film for protection against irritants while still allowing the skin to breathe. Propolis, an anti-oxidant is nutritious and restoring. Apply daily for soft, smooth lips.